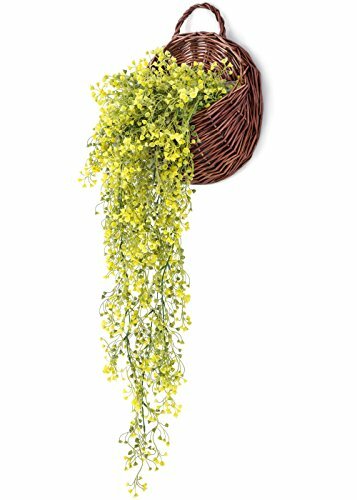 Item Includes:a wicker hanging basket, Artificial bracketplant flowers. The Size of Wicker hanging basket: 11 1/2" in diametre. Do you want to have the flowers which never wither and fall? Yes, we do! The artificial flowers we provide are made of plastic. Enjoy the beauty of natural looking flowers without the hassle of watering, wilting petals, or pesky insects. Perfect for all seasons. The flowers remain fresh and beautiful for years, perfect for wedding decoration, table arrangement or elegant home decoration. The artificial bracketplant flowers brings a real sense of nature to the indoors, with leaves hanging down to offer extra cover and a good look. Certain to brighten up any space, this piece will add warmth and comfort. Includes: a wicker basket, artificial bracketplant flowers. The hanging basket is made of Wicker and hand crafted. The artificial bracketplant flowers remain fresh and beautiful for years. The wicker basket can hold the faux plants, fruit, and various household items such as cosmetics, keys, pencils and more. Enjoy the beauty of natural looking flowers without the hassle of watering, wilting petals, or pesky insects. Perfect for all seasons. Never needs water or sun, making it a smart gift for someone who loves plants, yet is a bit forgetful when it comes time to water them! Artificial bracketplant flowers size: 34" Length. Wicker hanging basket size: 11 1/2" in diametre. Mkono is a registered trademark and our product is professional manufacturing and sole selling.